Rugby Australia branded as “unacceptable” social media posts by dual international Israel Folau on Wednesday. A RA spokesman said its integrity unit had been “engaged on the matter” after the decorated Wallabies fullback took to social media with more commentary on sexuality and religion, including an Instagram post that declared gay people would go to hell. Israel Folau's social media posts. “Rugby Australia is aware of a post made by Israel on his Instagram account this afternoon,” the spokesman said. The controversy comes less than a week after Folau became Super Rugby’s all-time top try scorer with his performance in the Waratahs’ loss to the Blues. On a week off due to a round nine bye, Folau took to Twitter and Instagram with his religious views. “The devil has blinded so many people in this world, REPENT and turn away from your evil ways. 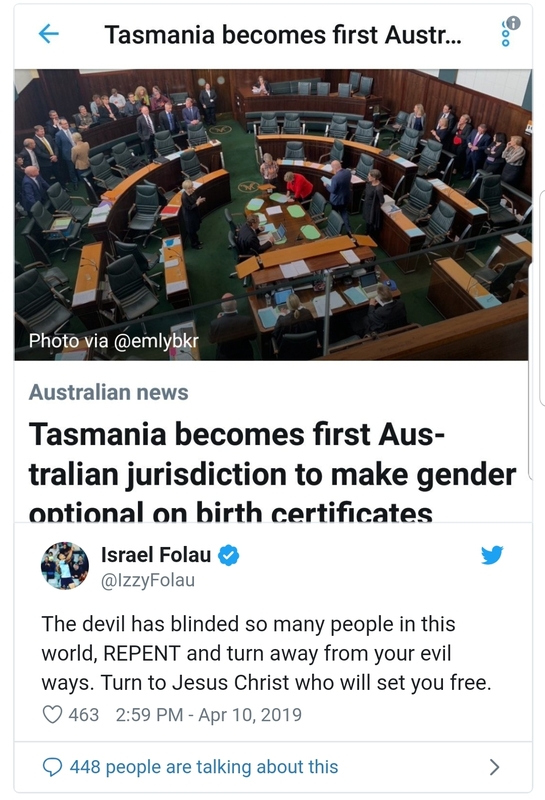 Turn to Jesus Christ who will set you free,” he wrote on Wednesday night above a screenshot of a news story covering the legislation passed in Tasmanian parliament that made optional in birth certificates a declaration of gender. 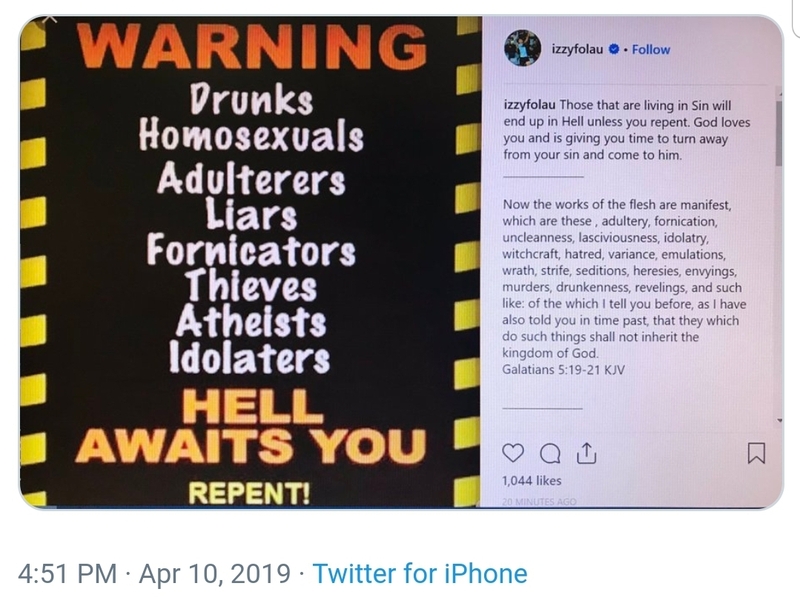 It is almost exactly a year since Folau plunged rugby into turmoil with a similar sentiment, stating gay people were “destined for hell”. The difference then was that some argued he had been goaded into the comment by a question from another user. On Wednesday his posts were unambiguous. The incident last year split opinion between supporters of Folau’s right to voice his beliefs and those who believed RA should have sanctioned him for comments deemed offensive and upsetting to large groups in the community. It put Folau’s contract negotiations on ice for many months, but the Waratahs fullback ultimately re-committed to Australian Rugby for four more years. The issue will be a major headache for RA boss Raelene Castle, who claimed the navigation of Folau’s first transgressions as a major victory in her first year in charge. Folau’s latest comments are arguably no more offensive but they do appear to be a brazen flaunting of an understanding the parties appeared to reach late last year, being that Folau tone down his public expressions of his faith to the extent that they not wilfully court controversy. The comments also heap further pressure on his teammates at the Waratahs and Wallabies, with a Super Rugby season in the balance and a World Cup looming. The Waratahs playing group were understood to be supportive of Folau but made their dismay known for the pressure and scrutiny it piled on them in the middle of last season. The NSW Rugby Union was contacted for comment. Can’t think much of his chat with RA recently!! Surely better things to do with his time!! It will be interesting to see how Raelene deals with this one. Especially with the world cup looming.. my guess is nothing will happen but a slap on the wrist, will sponsors follow through with their threats to move on like they did last year? An idea for Twiggy to give Qantas a call if they're looking for an opportunity on alternative sponsorship. Their accounts show $5million in sponsorship as non-current deferred revenue. In other words, paid in advance. I wonder what that/those sponsors think about this. If they were to walk away could they request their advanced payments back? I find this the most interesting. Qantas have definitely set themselves up as corporate watchdogs for misbehaviour (Margaret Court etc.) I certainly agree with them. They threatened last time. I don't see them having any choice but to follow through with their threat. Hopefully Qantas will look to other grassroots options to support Rugby. Twiggy.... call them! Major Wallabies sponsor Qantas, who threatened to pull its sponsorship last year following a series of provocative posts from Folau, hit out over the Waratahs flyer’s post. “These comments are really disappointing and clearly don’t reflect the spirit of inclusion and diversity that we support,” a Qantas statement to AAP said. Don't you just love some of this corporate jibberish? Ferinstance not that long ago we had a "Personnel" Department, then we became "Human Resources" which I didn't like but got used to. Now we are becoming "Human Capital", which is (IMO) bloody offensive. Glad I'm retired. So basically Qantas are saying we talk tough, but we really arent gonna do anything..
Would depend on the terms of the contract. OPINION: In the wake of his latest homophobic outburst - gays, among other sinners, are heading to hell once more - Israel Folau has to go, and will go. Quick. Clean. Gone. At least until such times as he repents. His contract will be suspended or terminated on the grounds of having breached either rugby's social media policy, or his contract. Rugby Australia simply has no choice. They cannot go through one more time the agony of last year when Folau's social media comments trumpeting that gays would go to hell, saw rugby lose sponsors, fans, and support. Then it took three weeks for Folau to pull his head in, and it seemed like he got it: that you couldn't be a standard bearer for the inclusive game of rugby and put out bigoted nastiness like that. Israel Folau will quickly find himself out in the cold after his anti-gay social media posts. This time, it won't take three weeks. Rugby must surely move quickly, or be made to look ridiculous. All of the dynamics that applied last year - outrage in the rugby and wider community, people swearing not to go to games, volunteers threatening to leave the game, sponsors looking at tearing up their contracts - apply this year, but there is one difference. Back then, it seemed it wasn't clear to Folau what he could and could not do. After that storm though, he can now be in no doubt ... and has done it anyway. Instead of lifting his index finger and pointing to the Lord in thanks as he is wont to do when scoring his many tries – as of last Saturday more tries than anyone in Super Rugby ever – he has effectively lifted his middle finger and showed it to gays, Rugby Australia, the rugby community, sponsors, the lot. Israel Folau has put his Waratahs team-mates in a difficult position with his social media posts. How can Rugby Australia not stand him down in response? 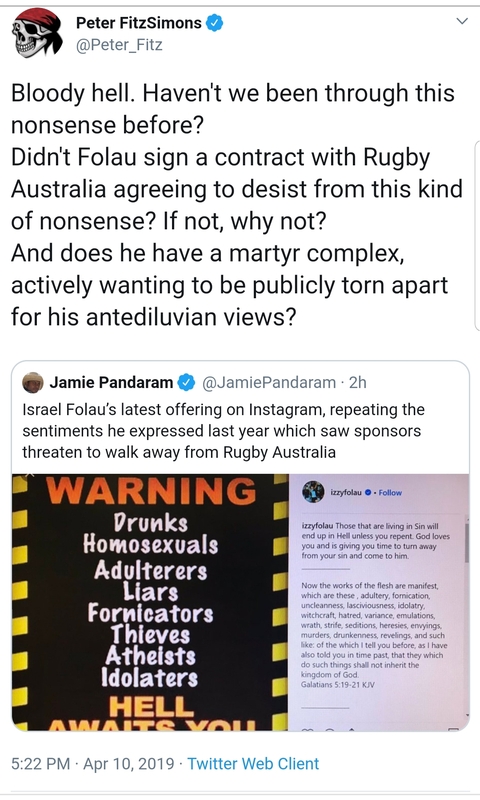 When they do, Folau will be inevitably defended by a certain section of the commentariat and community, spouting his right to "freedom of speech." That would apply if he was being dragged off to prison for his expressed views. He is not. He has exercised his rights to freedom of speech, just as the rest of us have exerted our rights to call him out for it, and Rugby Australia will be surely exerting its right to ensure that an employee to whom they are paying a reputed A$2 million a year comports himself in a manner that brings people into their tent, and doesn't drive them away from it. Rugby Australia will be saying, "You can continue to exert your right to speak, but NOT as our employee, as you disgrace what we stand for." After the events of last year, it will surely have been written into his contract that he is no longer allowed to post homophobic rants, and therefore rugby's own right to stand him down should be fairly cut and dried. If it was not written in his contract, Rugby Australia will have a serious case to answer as to why he was signed again without ensuring that their employee couldn't put them through precisely the same drama as last year. Either way, the whole affair is madness on the part of Folau, and dangerous madness at that. Beyond matters of money, sponsors, ticket-sales and all the rest, far more important is the impact of having homophobic dogma in the public domain. That impact includes shocking youth suicide rates among teens troubled about their sexuality. This is a serious matter, most of the country gets that and agrees we can no longer tolerate it. Both rugby union and even more particularly rugby league have been wonderful in recent times in stamping out homophobia within their own ranks. They have done so from both the moral imperative, and a business need. You cannot prosper in a community if you are not reflective of the community's values. Matt Burke Sez " Bone the Force , it aint working and not growing"
Nick "Off the bone" Cummins - Italy post match interview! What the hell is a "Google Search Cloud" ? All times are GMT +8. The time now is 17:12.